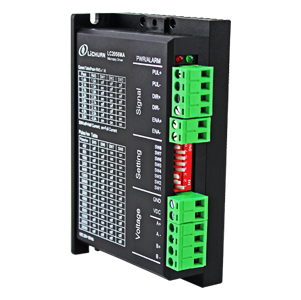 LC2056MA 2 Phase Nema23 stepper driver - 2 Phase hybrid stepper driver - Shenzhen Xinli Chuan Electric Co., Ltd.
LC2056MA uses servo control principle technology, with motor parameters adaptive function, to ensure the best performance of the motor. The technology can significantly improve the motor noise and smooth operation, the maximum drive current of 5.6A, the highest positioning accuracy of 128 subdivision up to 25600 steps / turn. SW5-SW8 four DIP switches to set the drive micro-step subdivision, a total of 15 steps of mic ro-step breakdown. When the user sets the subdivision, the drive should be stopped first. For details on the numberof microsteps,Please according to the drive panel. SW1-SW3 three DIP switches to set the drive output current, the output current of a totalof 8 floor.Details on setting the output current,refer to the description of the driver panel. SW4 can be used to set the automatic semi-flow function of the drive. OFF mean the quiescent current is set to half of the dynamic current, and ON means the quiescent current is the same as the dynamic current SW4 should be set to OFF for general use, resulting in reduced heat generation in the motor an the drive, resulting in improved reliability. Approximately 0.4 seconds after the pulse train is stopped, the current automatically reduced by 50% (60% of the actual value) and the calorific value is oretically reduced by 36%. PUL + and PUL- are the positive and negative terminals of the control pulsesignal;DIR + and DIR- are the positive and negative terminalsof the directional signal;ENA + and ENA- are the positive & negative terminals of the enable signal. The driver has two red and green lights. The green light is the power indicator, the green light is on when the driver is powered on. The red light is the fault indicator. When the overvoltage or overcurrent fault occurs, the fault light is on.Fault clear, the red light off. When the drive fails, the fault can only be cleared by re-powering up and re-enabling it. Driver dimension :117x78x34mm ,installation the hole spacing of 111mm can be horizontal . Suitable for all kinds of motion control equipment and instruments, such as: electronic processing and testing,semiconductor packaging, laser cutting and welding, laser phototypesetting, packaging machinery, engraving machines, marking machines, cutting machines, clothing plotter, CNC machine tools, automation Assembly equipment. Low noise, high-speed performance and cost-effective competition, the field of choice.